Mid 1980s. Few DOGFISH present. 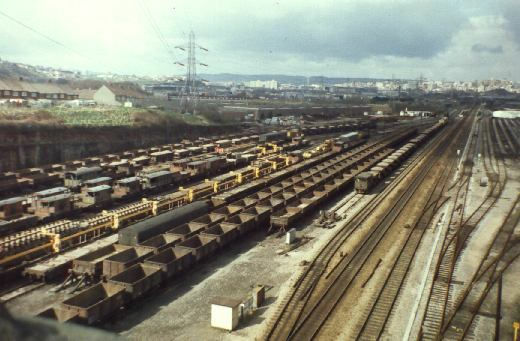 Many IRON ORE Tipplers for spoil and a track panel train, plus a variety of brake vans. An rare survivor was the SECR "Dance Hall" brake van (middle left). The sidings on the opposite side of the Bath line have been severed and destined to become an industrial estate. Brass from one of the warehouses on this estate was used to make moulds for some of our kits.